Now that the Earth Orb shines again you should return to Melmond and rest. It doesn’t seem like anyone cares about our accomplishment, so let’s go to another city. Exit Melmond, hop into your ship, and then head south. 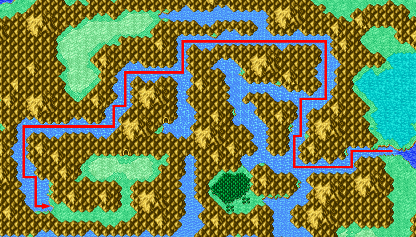 Once you reach the Cavern of Earth, navigate around the peninsula, and then head west. After a long journey across the ocean, you will find land again. Head south a bit until you reach another port. Exit your ship and head west over the land. Walk around the big crescent shaped lake, and enter the city. Welcome to Crescent Lake! 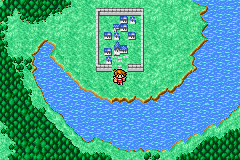 Crescent Lake is filled to the brim with all things Mythril. If you’ve been following along with this guide up until this point, and you’ve been good about collecting treasure chests, there will be little for you to purchase. If you have several “duplicate” party members (e.g., two or more warriors) you may be able to fill out some missing gear. As far as magic goes, you won’t find anything for a Red Mage, but most everything is available to White and Black Mages. The only exception is one of my most favorite spells, Exit, which is only available to Red and White Wizards. I guess we’ll be returning to Crescent Lake later in our adventure. As far as magic recommendations go, I would suggest Protera and Exit for White Mages and Wizards. Thundaga is the only spell I recommend for Black Mages and Wizards; The other black magic is situational at best (Stun) or low in accuracy and ineffective against most powerful enemies (Death, Quake). All we need is a little boy fishing to get a cease and desist from Dreamworks. A sword wrought from mythril. An axe wrought from mythril. A shield crafted from mythril. A helm wrought from mythril. Transports party out of dungeons. Calls an earthquake to swallow foes. After outfitting your party, head behind the magic shops, then turn east. Follow the path and you should see a circle of sages. Talk to the sage at 5 o’ clock. He will present a new mode of transportation for you! With the canoe, you can now cross rivers and lakes! Playing the “one of these things is not like the others” game will let you know that the blue sage located at 5:30 will be important later in our adventure. Exit the city and head back to your ship. You can now take a shortcut by heading directly east and traveling across the lake. Once in you boat, head directly north until you see the mouth of a river. Move the boat to the mouth of the river, and press left. You will leave the ship at the mouth of the river and now be traveling in the canoe! Follow the winding river west, north, west again, south, and then east. Use this map for clearer directions. Our destination is the Cavern of Ice, home of the fabled Levistone. 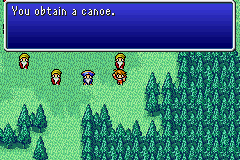 I typically don’t question where video game characters keep items hidden (looking at you, Link), but “pocket canoe” is a bit much. 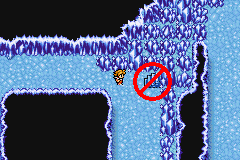 The Cavern of Ice is one of the most dangerous dungeons in the entire game. There are many enemies that can either kill you in a single hit or turn you to stone. I am going to advise that you run from every encounter that you come across. Fight at your own risk. Note that if you get into battle with Piscodemons you cannot flee; It’s best to take them down using the same tactics we used in the Marsh Cave. B1 has no treasure that you can reach, and neither does B2. Move as fast as you can and take as direct a path as possible. A brief interchange on B3 will return you to B2, but in a previously inaccessible location. Follow the path until you find a chamber. Enter it, but be careful not to step on any cracks, at least not yet. The treasure chest on the left contains a Flame Sword, so make sure to grab it. The treasure chest on the right only contains clothes, and is guarded by extremely dangerous Dark Wizards, so there is no need to bother with it. After you have the Flame Sword, step on any of the cracks and plunge to the next floor. Cartoon physics: You don’t fall until you look down. Now things get interesting. You will notice in several areas that the floor looks different. Stepping on these tiles will reduce your HP, so take make sure to take a direct path over them to reduce the damage you will take. 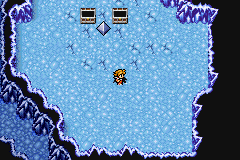 The room to the west of where you fall has a dangerous White Dragon guarding the first chest, which means you’ll have to fight it twice if you want both the Mythril Gloves and the Ice Armor. Fortunately, Mythril Gloves are available for purchase in Crescent Lake, so if your party is hurting, there’s no need to grab chest #1. Proceed to the south. All of the treasure in the southwest chamber is Gil, so you can leave it behind if you’re in a hurry. The stairs in the southeast corner will lead you back to B1, but in a section that you could not reach before. WHATEVER YOU DO, DO NOT CLIMB THE STAIRS TO THE EAST! They lead back to the surface, and if you climb them, you will have to start your journey through the Cavern of Ice all over again. The only way to proceed is to step on the crack in the eastern-most room. Be sure to collect any treasure you want before doing so. No jokes for this one: These stairs lead outside! Do not walk up these stairs until you are ready to leave! After falling through the crack, move towards the remaining treasure chest. Directly in front of it you will encounter the Evil Eye. This monster has very low defense and very little HP. Evil Eye has an instant death attack, but otherwise is pretty harmless. Attack him as hard and fast as you can. The Evil Eye should fall in two rounds of fighting, quite possibly sooner depending on party and levels (there’s a good chance any Monks in the group will one-shot him). Compared with some of the other enemies in the Cavern of Ice (White Dragons, Dark Wizards, Mindflayers, Cockatrice, etc.) the Evil Eye is quite weak. 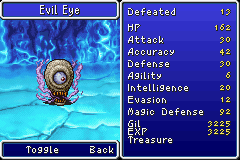 It’s worth noting that the Evil Eye drops a ridiculous 3225 Gil and awards 3225 experience points when defeated. Since the Evil Eye is a forced encounter, rather than a proper boss, you can “farm” him for Gil if you are short on funds. This can be a bit risky at this point in our adventure, as we don’t have any defense against instant death attacks yet, but the potential rewards are enormous. After defeating the Evil Eye, collect the treasure that he was guarding. You now have the Levistone! This rock will summon an airship from the desert south of Crescent Lake. Now you have to step on a crack, which will take you back to a familiar room on B3. Follow the same path back to B1 and climb the stairs that I previously told you not to climb. Once outside, navigate back to the ship, then head south, past the Crescent Lake port, until you see a river near a desert. Exit you ship via the canoe and walk into the desert. You’ll now watch a cinema scene depicting the desert floor opening up and an airship rising from the depths. Congratulations! You now have the ultimate mode of transportation! 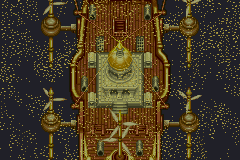 One thing to note about the airship is that you can only land on grassland and plains. This means that you may have to hike a good bit to actually reach your destination.